Julie Larsen Maher/Wildlife Conservation SocietyThe missing Egyptian cobra was found in the Bronx Zoo’s reptile house on Thursday. Updated | 4:51 p.m. She’s been found! The Egyptian cobra at the Bronx Zoo that had been missing for seven days has been located, officials said on Thursday. The cobra is “alive and well,” James J. Breheny, the zoo’s director, told dozens of reporters who had gathered for a 4 p.m. news conference at the zoo. The adolescent snake was found inside a non-public area of the zoo’s Reptile House, and was in “really good condition,” he said. Since her escape, the cobra had inspired feverish news coverage and a wildly popular fake Twitter feed. Robert Stolarik for The New York TimesJames J. Breheny, Director of the Bronx Zoo, announced at a news conference that the cobra had been found early Thursday morning. Zoo officials said the Reptile House would remain closed for several days while they investigated how the snake escaped and monitored the escapee. Mr. Breheny said at the news conference that officials had not yet changed any protocol but “have double-checked existing protocol and have people double-checking each other.” Last Friday, when the snake went missing, it was not in the exhibit itself but in an off-exhibit holding cage. 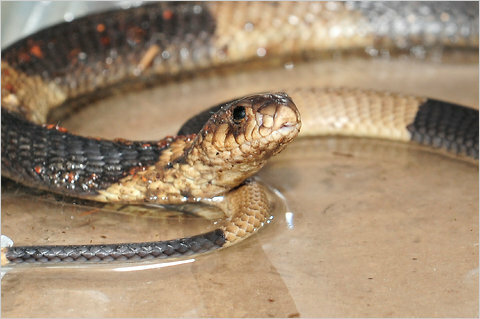 News of the Egyptian cobra’s capture reverberated in the Twittersphere, where it quickly became a trending topic, and many said they would miss the frequent updates from @BronxZoosCobra — who has remained silent since the capture. 3. The zoo borders the south side of theNew York Botanical Garden. 9. Theodore Roosevelt and William Hornaday, the Bronx Zoo's first director, helped form the American Bison Society(ABS) at the zoo in 1905. 10. The buildings in Astor Court were designed by the firm of Heins & Lafarge, who also designed the original plans for the cathedral of St. John the Divine inManhattan's Morningside Heights. 101. The Bronx Zoo once ran the Wildlife Survival Center on St. Catherine's Island off the coast of Georgia before it was shut down in 2005. The Trailside Summer Music Concert Series! Join us Saturday, April 25th at 1 PM for some original art-rock on environmental themes during Trailside's Earth Day Celebration. The State Workers are a collaborative musical group who blend sustainability, a "Do-it-Yourself" spirit, and the "Cosmic Yes" into everything they do. The result is a fusion of jazz, rock, folk, country, blues, and world music that has been heard in New York City, Jersey City, and throughout small towns across the Highlands. Their music was featured at the grand opening of the Trailside Museums and Zoo Amphitheater where they were joined by the audience in acoustic renditions of their original environment focused compositions. For this special acoustic Earth Day Concert the State Workers will feature an "up-cycled" drum set made entirely out of re-purposed materials – otherwise known as "stuff the drummer found in his basement." Don't miss it! The Trailside Summer Music Concerts provide a fun and free arts experience to our community, celebrate the diversity of our region, and introduce the public to the Trailside Amphitheater as an exciting new space for environmental education. In addition to the concert, the Trailside Zoo hosts an all-day Earth Day Celebration! The concert is FREE and open to the general public. Parking may be limited, so arrive early and enjoy the Zoo before the concert! The Trailside Summer Music Concert Series is made possible in part by a generous grant from the Decentralization Program of the New York State Council on the Arts, administered by Arts in Orange. Thank you NYSCA! Trailside Museums and Zoo is part of the Palisades Interstate Park Commission, which administers 29 parks, parkways, and historic sites for the Office of Parks, Recreation and Historic Preservation in New York as well as the Palisades Interstate Park and parkway in New Jersey. For more information about New York State parks and historic sites, please visit www.nysparks.com, for information about the New Jersey section of the PIPC please visit www.njpalisades.org, and for more information about the Palisades Parks Conservancy and the Palisades Interstate Park parks and historic sites, please visit www.palisadesparksconservancy.org. Celebrate Earth Day at the Zoo! The first concert of the Trailside Summer Music Series! For more information, please call 845-786-2701, ext. 265. Suggested donation: $1 per visitor; parking at Bear Mountain State Park is $7.00 per car. Trailside Museums and Zoo at Bear Mountain State Park can be reached via Exit 19 of the Palisades Interstate Parkway or from Route 9W. Wheelchair accessible Zoo parking available. For more information or special access needs, contact the office at 845-786-2701, ext. 265. TDD users should call the NY Relay Service at 1-800-662-1220. A complete calendar of all park events may be requested from the Park Office at 845-786-2701 between 8 AM and 4:30 PM or go on-line to www.palisadesparksconservancy.org or www.njpalisades.org. FREE PRIZES & LOTS OF FUN! 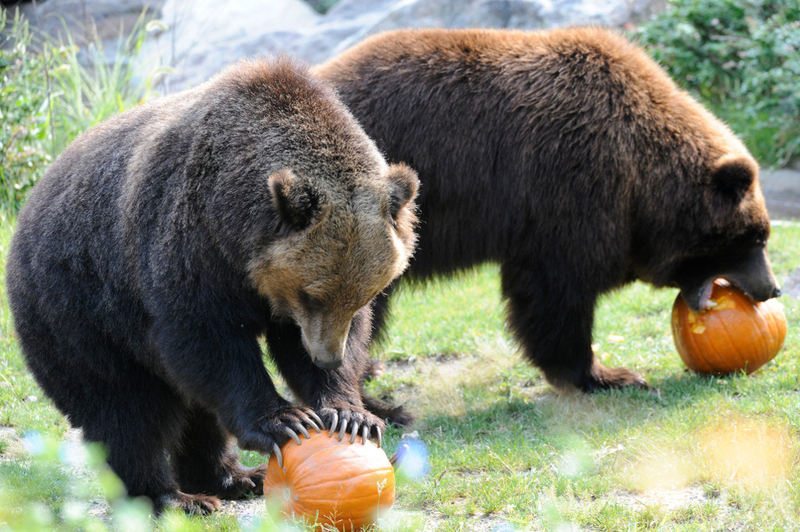 While you are at Bear Mountain, ride the Merry-Go-Round's hand-carved wood animals and visit our resident black bears Reba, Pal, and Sadie at Trailside Museums and Zoo. Bear Mountain State Park can be reached via Exit 19 of the Palisades Interstate Parkway or from Route 9W. For more information or special access needs, contact the Bear Mountain Office at 845-786-2701. TDD users should call the NY Relay Service at 1-800-662-1220. Bear Mountain State Park is part of the Palisades Interstate Park Commission, which administers 29 parks, parkways, and historic sites for the Office of Parks, Recreation and Historic Preservation in New York as well as the Palisades Interstate Park and parkway in New Jersey. For more information about New York State parks and historic sites, please visit www.nysparks.com, for information about the New Jersey section of the PIPC please visit www.njpalisades.org, and for more information about the Palisades Parks Conservancy and the Palisades Interstate Park parks and historic sites, please visit www.palisadesparksconservancy.org. Speakers Hope Ryden & John Miller will talk about their unusual trip to Great Inagua, 50 miles off Haiti and about the same distance from Cuba , one of the three last breeding grounds of the Great Flamingo, (Phoenicopterus ruber.) Hope and John needed special permission to go to this remote place, and what they found in this protected island was more than they could have dreamed. The Northern Cricket Frog (Acris crepitans) is New York's only listed "endangered" frog species. NY's remaining populations of our state's tiniest vertebrate occur exclusively in the Mid-Hudson region. Of these, two of NY's largest and healthiest metapopulations thrive in Orange County, one at Sterling Forest. The Cricket Frog's peculiar ethology includes a fascinating overland migration each spring and autumn, spanning several distinct and essential habitat-types, a behavior that may hold clues to the cause of its decline. In the face of worldwide amphibian decline, Orange County's Cricket Frog serves as an acute, local example of a staggering global crisis, and may present a recovery model for protecting this vast and fascinating class of animals, the Amphibians, worldwide. Jay Westerveld, founder of the New York Natural History Council, a non-profit/non-advocacy research and education organization dedicated to the study of NY's natural sciences will lecture. He is credited with identifying NY's largest population of Northern Cricket Frogs in 1977, as well as several other local endangered species populations. Bannerman's Island, as it is locally known, lies close to the eastern shore of the Hudson between Cornwall and Fishkill. In 1900, Pollepel Island (official name), was purchased by Francis Bannerman VI to provide storage for his collection of military arms and ordnance, considered to be the largest in the world. Not content to build mundane structures, he built castle-like fortresses that have been a source of wonderment to generations. A few years ago the Bannerman Castle Trust (BCT) a friends group working with New York State Parks Recreation and Historic Preservation, opened the island for public walking tours of the island and its ruins. The BCT's goals are to stabilize the remaining structures for the enjoyment and education of future generations. Wes & Barbara Gottlock of the Bannerman Castle Trust are retired educators who share a love for the Hudson Valley. Barbara is a docent, BCT board member, and coordinator of volunteers for the island. Wes is also a docent and coordinates public tours to the island. Barbara and Thom Johnson, along with Wes, published the Arcadia Images of America title "Bannerman Castle" in 2006. They are currently working on another book in the Arcadia series, "Lost Towns of the Hudson Valley"
With the oncoming of spring, plans are being set for the second year of a DEC-funded study that aims to survey and conserve three turtle species of greatest conservation need in Harriman and Bear Mountain State parks. The presentation will sum up the first year's telemetry results and discuss plans for year two. Matthew Shook (HEnRI) & Marnie Miller-Keasis (SCA) will lead this lecture. Marnie Miller-Keasis is in her second 10-month term as an SCA Biodiversity Intern at Trailside Museums & Zoo. Matthew Shook is the Assistant Director of the Highlands Environmental Research Institute (HEnRI), where he has worked for four years. Before working at HEnRI, Matt was an SCA Intern at Trailside Museums & Zoo. Sunday Brunch at Bear Mountain State Park's Overlook Lodge Is Back! Served 11 am to 2:30 pm. Our Sunday brunch offers an array of chilled salads, smoked and raw bar, made-to-order omelets, carving station, lavish desserts, and much more. Complimentary champagne and Bloody Mary Bar. The Palisades Interstate Parks Commission and Trailside Museums announces the pilot year of their new program: Artists in the Parks. The goal of Artists in the Parks is to support local artists' access to sources of inspiration, and to encourage artistic exploration of New York State Parks in the Palisades Region. We are currently looking for Hudson Valley and NYC artists who would like to become members of Artists in the Parks. Artists of all mediums are encouraged to join. Artists who join during this pilot year will have the unique opportunity to help shape the program's structure and offer input into the creation of the Artists in the Parks website. Artists in the Parks receive benefits such as seasonal roadside parking access in Bear Mountain and Harriman Parks, exposure for their art through the program website, and possible opportunities to display and sell their work in Park venues. In exchange for these annual privileges, artists offer the PIPC fair use of at least two hi-resolution images of their work for promotional and educational materials per year. "As an artist whose love for nature has led her to focus on creating oil paintings of the landscape, I am thrilled to be participating in the Artists in the Parks program. It will give me the opportunity to paint the many beautiful locations in the park that would otherwise be difficult or impossible to reach. It will open up new possibilities for sharing and selling my work, and it will enable me to tangibly support the preservation of the wonderful land that makes up the Park system." "[A program like this] was something we dreamed about. Thanks to Artists in the Parks, we will now have the freedom to document on canvas a place that has been near and dear to us for over 30 years. As artists, having a purpose to painting is a wonderful feeling." "Living in the Hudson Valley all my life has given me a deep appreciation and the utmost respect of the natural beauty that surrounds us. So many of us spend our time running around, doing this and that, and never take the time to stop and see the glitter of sunlight casting its glow through the forest. As a painter, my mission is to capture fragments of these subtle moments, to preserve and share, for future generations to come. Being a member of Artists in the Parks will help me accomplish this."